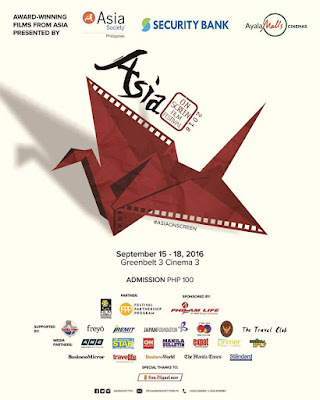 ASIA ON SCREEN is Manila’s premier Asian film festival featuring award-wining and critically-acclaimed films. Now on its 3rd year, Asia On Screen Film Festival 2016 will showcase 13 films representing 11 Asian countries on September 15-18, 2016 at Greenbelt 3 (Cinema 3) in Makati City. With the burgeoning of the film industries across Asia, the world of arts and cinema and entertainment in Asia has never been more exciting! 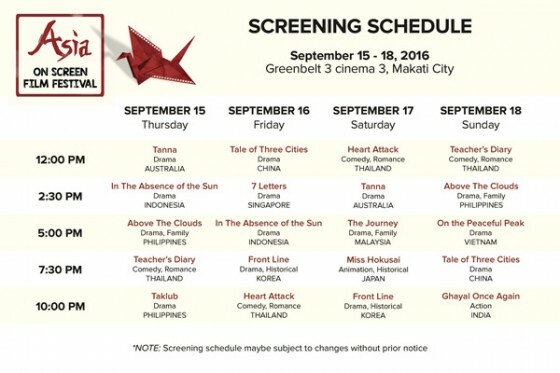 Tickets will be available on-site at the Greenbelt 3 Cinemas at PHP 100 per screening. Catch award-winning, critically acclaimed films from around the region at Asia On Screen from Sept 15-18, 2016 at Greenbelt 3 Cinema 3. In a traditional tribal society in the South Pacific, a young girl, Wawa, falls in love with her chief’s grandson, Dain. When an inter tribal war escalates, Wawa is unknowingly betrothed as part of a peace deal. The young lovers run away, refusing her arranged fate. They must choose between their hearts and the future of the tribe. Yuerong is a young widow who is forced to peddle opium in order to support her two little daughters. Daolong is a handsome officer at a river checkpoint. When Daolong becomes the target of both the Nationalists and the Communists, the couple is forced to escape across a country devastated by famine and war. The film is based on the true love story of actor Jackie Chan’s parents. A tender, melancholic night is experienced through the eyes of three women as they struggle to find themselves in the ever-changing concrete jungle of Jakarta. Early in the Korean War in 1950 as the North is rolling through South Korea, South Korean privates Eun-pyo and Soo-hyeok are captured during a battle and brought to North Korean captain Jung-yoon. Afterwards he lets the prisoners go free, so that they can help reconstruct the nation after the war. Bee comes home to Malaysia after graduating abroad and brings back her foreign fiance Benji. Her father, Uncle Chuan, vigorously opposed the marriage due to Ben’s frivolous behavior but he failed to change his daughter’s mind. In the end, Uncle Chuan agrees to the marriage with the condition that the wedding adheres to Chinese tradition. After losing his parents in a flood, 15-year-old Andy is forced to live in the Mountain Province with his estranged grandfather. Feeling they've lost everything, the two embark on a journey up a mountain and start to come to terms with their grief. After the Supertyphoon Haiyan, which changed the city of Tacloban in the Philippines into its horrendous state, the lives of Bebeth, Larry and Erwin intertwine. The survivors are left to search for the dead, while keeping their sanity intact, and protecting what little faith there may be left. 7 Letters represents seven heartfelt ‘love letters’ to Singapore, capturing each of the directors’ personal and poignant connection with the place they call home. The seven stories tell of our heartland and its people through tales of lost love, identity, inter-generational familial bonds and tensions, unlikely neighbors, and even references to traditional folklore. Yoon is the busiest 30-year-old freelance graphic designer in Thailand. After staying up working for 5 days straight, strange rashes appears all over his body. He meets Doctor Imm at a public hospital and falls in love with her. Will Doctor Imm be able to diagnose Yoon’s syndrome before his heart condition gets worse? Song, a former professional wrestler, finds a new job as a teacher at a primary school located on a floating community surrounded by mountains. He discovers a former teacher’s diary and falls in love with the unacquainted writer. Will these two teachers finally meet? The film tells story of a traditional ceramic village in Ninh Thuan province. The people of the Cham minority have experienced many ups and downs and realize that they cannot live in poverty forever. But as changes develop, they must also respect and conserve the cultural heritage of their village. Please see official Facebook event page: http:/tinyurl.com/AsiaOnScreen2016, and @AsiaSocietyPH for details.